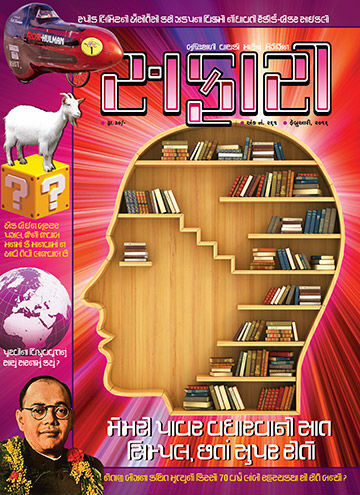 The February 2016 issue of Safari – a knowledge magazine from India – Gujarati edition is published quite on time. We are of course excited to see the content of the same and here are our views and reviews for the same. The cover page is very attractive and interesting. We have mentioned in many articles that we consider “the editorial” as one of the most important part of any magazine. It not only establishes a link between the reader and the editor but also gives the editor to represent his/her vision about the content of the issue, and current happenings. The editorial of this month talks about “Free Electric”, a cycle which produces the energy in addition to keep you fit. It is important to know about such amazing things. These are the real life changing things. Why can’t we think to implement such things in Gym? At the end of the day, so many such cycles (as replacement of regular cycles in gym, which are used by the members anyway) to produce a lot electricity for a small unit? We all know a lot (or at least basics) about Prime Meridian aka Greenwich Meridian. Recently we got to read that it is actually not situated where it is believed to be! By seeing one such demonstration, the famous columnist Bob Berman raised his wish to do the experiment on his own! And… Well the article by B. M. Purohit, explores a lot of facts. Don’t give it a miss. Have you heard about Monty Hall problem (If not, please visit https://en.wikipedia.org/wiki/Monty_Hall_problem)? Susheel Bhatiya brings an interesting article here. As today when Brain games are are considered as “brain tonic”, such puzzles become more relevant and gets more exposure. The puzzle on the first hand looks pretty simple and it is obvious to think that we know the answer. However if you keep moving ahead towards the solution, you may find that it is not the case. The article will be found interesting by those who loves to explore talent driven games. Netaji Subhash Chandra Bose was an ace freedom fighter of India and he will be remembered that way for ages. There are many controversies associated with him during his life and the scenario is not changed even today. His death is considered as a mystery and a lot of people from the country believes that all the information about his death should now be disclosed and made public. Nagendra Vijay comes with a very interesting article about the mysterious death of Netaji. The article is well written and the content itself will make you feel the amount of research made, to compile the same. Nagendra Vijay brings one more interesting article which analyse the facts about education. It is mainly focused on students of USA. Editor Harshal Pushkrana comes here with an interesting article about Cycles. The article is studded with photographs of various cycles, by seeing which you will say, “well, this is not looking like a cycle!” The article is informative and a good read. Is there any simple way to improve memory power? And what is the reason that in many cases we tend to forget the answer during the exam, despite of learning it thoroughly throughout the year? Don’t try eat the entire food at once, you need to break it into several bytes. Don’t try to read everything in a shot, take breaks at regular intervals. Try to convert the boring information into an interesting story. The more general knowledge you store in your brain, the more memory power you have. This section answers the following interesting questions. There are several countries which are using some other timezone for the standard rather than their own geographic time zone, why so? There 523 lions in Gir forest, how many of them exists in Africa? How many Indian satellites are active in the orbit as of now? Had Pakistan launch any satellite so far? Please explain emergency breaking system of Trains. James Bond (in films) is almost showed with so many bullets but was not fatally injured ever, based on the rule of probability is it possible? The ratio of fatal accidents in Atomic reactors is around 2% only, why then so many countries are not open to accept nuclear energy as alternate power source? What is the issue of SirCreek between India and Pakistan? Why it is not resolved since so many years? Among all trees why only Bamboos grow up so fast? There are so many energy drinks in the market these days. How they ignites energy so rapidly? Which bird (species) builds the largest nest? Scientist Marie Curie was awarded Nobel prize for the invention of radium. She received one more nobel prize as well, what that was for? What is the solution of traffic jam happens in metro cities like Mumbai, Delhi, Pune, Ahmedabad and others? According to us, it is definitely a “value for money” issue. It gives you best for not only the money, but also for the time you spend to read it. It is hard to find such nice reading material at such low cost. The only thing in its against is, it is available in a regional language only, making its reach limited.